Is a system used to relieve tension and treat illness, based on the theory that there are reflex points on the feet, hands, and head linked to every part of the body. Reflexology is a deeply healing form of bodywork. Its effects are very powerful and far-reaching. It is a non-invasive integrative therapy and is recognized by The National Institutes of Health (NIH) and the National Center for Complementary and Alternative Medicine (NCCAM) as a separate body-based discipline with a distinct professional definition. Research studies in the U.S. and around the world indicate positive benefits of reflexology for various conditions. There are several well-designed studies, funded by the National Cancer Institute and the National Institutes of Health that indicate reflexology is a tool to reduce pain and enhance relaxation, sleep, and the reduction of psychological symptoms, such as anxiety and depression. What is a Certified Reflexologist? Rosemary was trained by Susan Raskin MS, RN, a Clinical Nurse Specialist in Holistic Nursing. Her credentials include certification as ab instructor of reflexology through the American Commission for Accreditation of Reflexology Education and Training (ACARET). and The National Certification Board for Therapeutic Massage & Bodywork (NCBTMB). 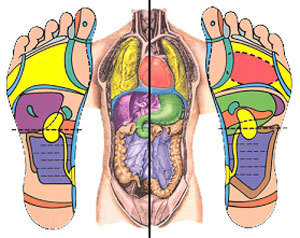 Reflexology has roots that go back to ancient cultures including those in Egypt and China. There are references in the Bible to anointing feet with oil. Native American (specifically Inca's & Cherokee) also are believed to have passed down the use of pressure therapy on the feet. Evidence shows that it was first practiced in Europe in the 1500's. In the early 1900’s “zone therapy” was introduced in the U.S. by Dr. William Fitzgerald. Others who contributed to modern-day Reflexology include Dr. Joseph Shelby Riley and Ms. Eunice Ingham both of whom in the 1920's and 1930's began to modernize the zone therapy methods. Over time this has evolved into what Reflexology is today.